My post on the Norman made me think about several other "micro-men's" models from the 1940's that are so small, that it's a wonder they were good sellers during their time. Most of these diminutive models utilize 14/0-sized movements. Take for example, the Elliott. However, the 8/0 sized movements are represented too. I think the smallest round watch I've ever come across is the 1949 Todd. 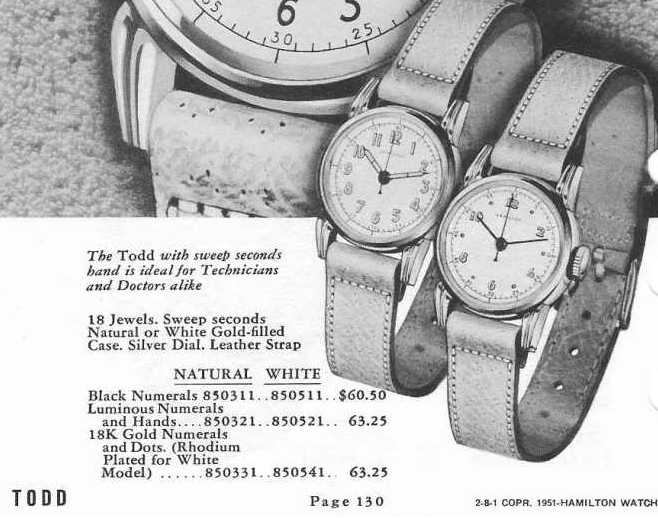 The Todd featured Hamilton's "new" 18 jewel, central sweep second movement, the 748. When introduced, the model came in a 10K yellow gold filled case with a choice of a luminous dial or a black enamel numeral dial. 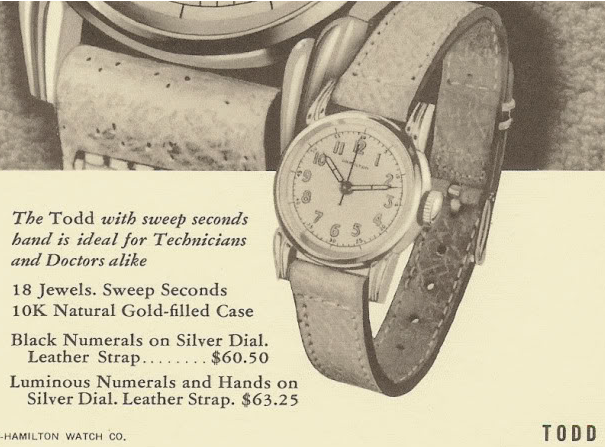 However, by 1951 (it's last year of production) the Todd was also available in a 10K white gold filled case and an Applied Gold Numeral (and Dot) dial was available with either yellow numerals and dots or rhodium plated solid gold numerals and dots (for the white case). Another interesting bit of trivia with the Todd is the variety of hands. The black numeral dial used a style of hands called "leaf". 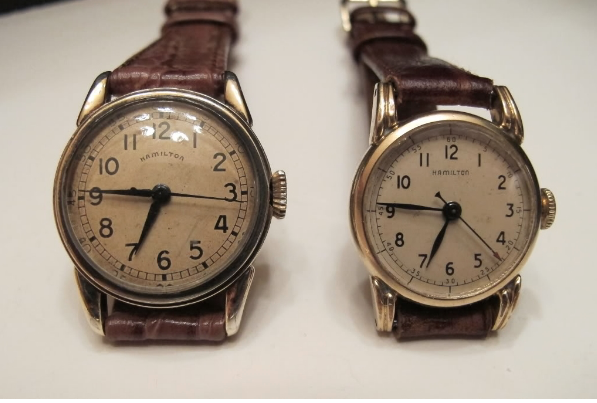 The luminous dial used a style often called "military" and the AGN dial used "baton" hands. They all used the same style second hand with an arrow point on the extreme end and a whale fin on the center end. I think the Todd is a nice looking watch with it's fluted lugs and clean dial. The dial is no larger than the 8/0 sized 748 underneath it and it's very compactly packaged into the case. The strap is 14mm wide (whereas most of the time it's 16mm wide or wider) - so just based on the proportions, you'd never guess the Todd was as tiny as it truly is. As example, check out the Todd next to the Secometer that was produced the prior year. The Secometer utilized the larger 6/0 sized 987S movement. It's a fairly small watch by today's standards but typical for a vintage watch. 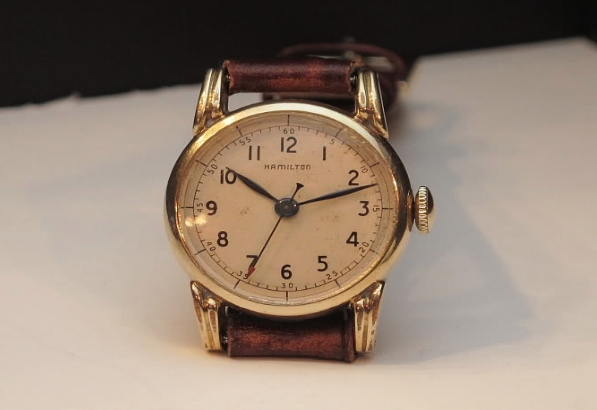 I've been enjoying my 1949 Hamilton Todd very much. It was recently serviced and keeps perfect time, within a few seconds each day. These must have been popular because they're so comfortable! Have mine on a 14 mm vintage pigskin strap and it's easy to forget it's on my wrist. Crown is not original, though, any ideas where to source a correct one?